For the entire Game Boy line of handheld consoles, see Game Boy family. Nintendo's second handheld game console, the Game Boy combines features from both the NES home system and Game & Watch hardware. The console features a dull green dot-matrix screen with adjustable contrast dial, five control buttons (a directional pad, two game buttons, and start and select), a 2-voice speaker with adjustable volume dial, and, like its rivals, uses cartridges as physical media for games. The color scheme is made from two tones of grey with accents of black, blue, and maroon. All the corners of the portrait-oriented rectangular unit are softly rounded, save for the bottom right, which is curved. At launch, it was sold either as a standalone unit, or bundled with the one of several games: Super Mario Land orTetris among them. Several accessories were also developed, including a carrying pouch and printer. Despite being technically inferior to its fourth-generation competitors (Sega's Game Gear, Atari's Lynx, and NEC's TurboExpress), the Game Boy received praise for its battery life and durability in its construction. It quickly outsold the competition, selling one million units in the United States within a few weeks. The Game Boy and its successor, the Game Boy Color, have sold an estimated 118 million units worldwide. It is one of the most recognizable devices from the 1980s, becoming a cultural icon in the years following its release. Several redesigns were released during the console's lifetime, including the Game Boy Pocket (1996) and the Game Boy Light (1998; Japan only). Production of the Game Boy continued into the early 2000s, and eventually stopped after release of its successor, the Game Boy Advance, in 2001. The original internal code name for the Game Boy was "Dot Matrix Game", and the initials DMG came to be featured on the final product's model number: "DMG-01". Internal reception of the console at Nintendo was initially very poor; the DMG even received the derogatory nickname "DameGame" from Nintendo employees, with dame being Japanese for 'hopeless' or 'lame' in that context. The Game Boy has four operation buttons labeled "A", "B", "SELECT", and "START", as well as a directional pad (d-pad). There is a volume control dial on the right side of the device and a similar dial on the left side to adjust the contrast. At the top of the Game Boy, a sliding on-off switch and the slot for the Game Boy cartridges are located. The on-off switch includes a physical lockout to prevent users from either inserting or removing a cartridge while the unit is switched on. Nintendo recommends users leave a cartridge in the slot to prevent dust and dirt from entering the system. The Game Boy also contains optional input and/or output connectors. On the left side of the system is an external 3.5 mm × 1.35 mm DC power supply jack that allows users to use an external rechargeable battery pack or AC adapter (sold separately) instead of four AA batteries. 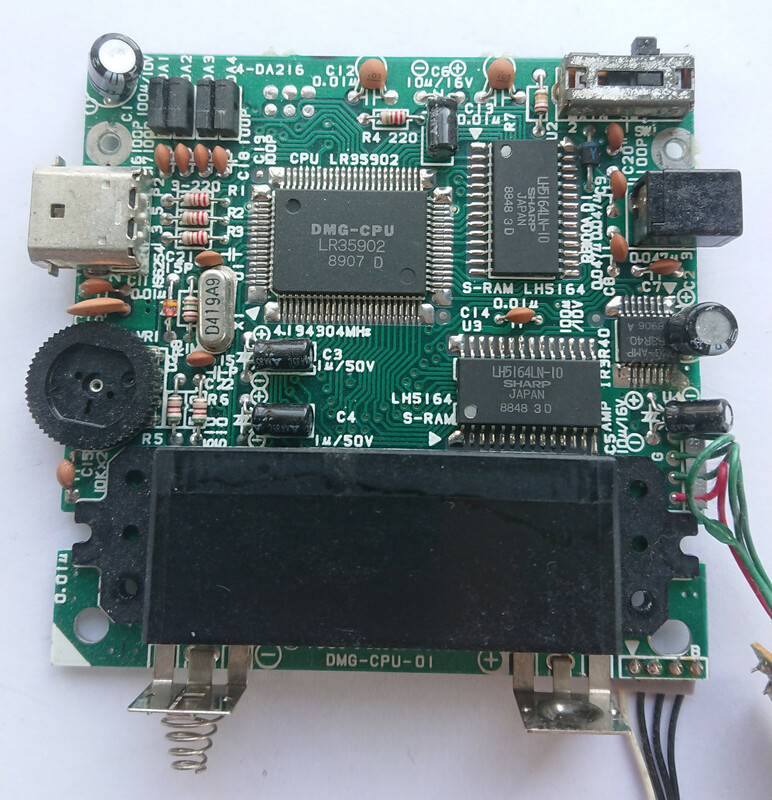 The Game Boy requires 6 V DC of at least 150 mA. A 3.5 mm stereo headphone jack is located on the bottom side of the unit which allows users to listen to the audio with the bundled headphones or external speakers. The right-side of the device offers a port which allows a user to connect to another Game Boy system via a link cable, provided both users are playing the same game. The port can also be used to connect a Game Boy Printer. The link cable was originally designed for players to play head-to-head two-player games such as in Tetris. However, game developer Satoshi Tajiri would later use the link cable technology as a method of communication and networking in the popular Pokémon video game series. CPU: Custom 8-bit Sharp LR35902 at 4.19 MHz. This processor is similar to an Intel 8080 in that none of the registers introduced in the Z80 are present. However, some of the Z80's instruction set enhancements over the 8080, particularly bit manipulation, are present. Still other instructions are unique to this particular flavor of 8080/Z80 CPU. Parity flag, half of conditional and all input-output instructions were removed from 8080 instruction set also. The IC also contains integrated sound generation. Sound: 2 pulse wave generators, 1 PCM 4-bit wave sample (64 4-bit samples played in 1×64 bank or 2×32 bank) channel, 1 noise generator, and one audio input from the cartridge. The unit only has one speaker, but the headphone port outputs stereo sound. Communication: 2 Game Boys can be linked together via built-in serial ports, up to 4 with a DMG-07 4-player adapter. And 16 in maximum. On March 20, 1995, Nintendo released several Game Boy models with colored cases, advertising them in the "Play It Loud!" campaign, known in Japan as Game Boy Bros.[c] Specifications for this unit remain exactly the same as the original Game Boy, including the monochromatic screen. This new line of colored Game Boys would set a precedent for later Nintendo handhelds; every one of them since has been available in more than one color. Play It Loud! units were manufactured in red, green, black, yellow, white, blue, and clear (transparent) or sometimes called X-Ray in the UK. Most common are the yellow, red, clear and black, Green is fairly scarce but blue and white are the rarest. Blue was a Europe and Japan only release, White was a Japanese majority release with UK Toys R Us stores also getting it as an exclusive edition to them. The white remains the rarest of all the Play it Loud colors. A rare, limited edition Manchester United Game Boy is red, with the logos of the team emblazoned on it. It was released simultaneously with the Play it Loud! handhelds in the United Kingdom. The Play It Loud's screens also have a darker border than the normal Game Boy. In July 21, 1996, Nintendo released the Game Boy Pocket: a smaller, lighter unit that required fewer batteries. It has space for two AAA batteries, which provide approximately 10 hours of gameplay. The unit is also fitted with a 3 volt, 2.35 mm x 0.75 mm DC jack which can be used to power the system. The Pocket has a smaller link port, which requires an adapter to link with the older Game Boy. 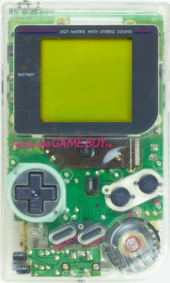 The port design is used on all subsequent Game Boy models, excluding the Game Boy Micro. The screen was changed to a true black-and-white display, rather than the "pea soup" monochromatic display of the original Game Boy. Also, the Game Boy Pocket (GBP) has a larger screen than the Game Boy Color (GBC) that later superseded it. The GBP's screen has a 65 mm (2.56 in) diagonal, 48.5 mm (1.91 in) width, and 43.5 mm (1.71 in) height, compared to a 59 mm (2.32 in) diagonal for the GBC. 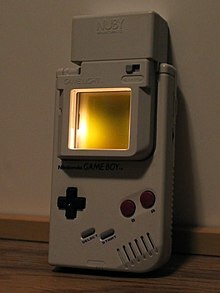 Although like its predecessor, the Game Boy Pocket has no backlight to allow play in a darkened area, it did notably improve visibility and pixel response-time (mostly eliminating ghosting). The first version did not have a power LED. This was soon added due to public demand, along with new Game Boy Pocket units of different colors (released on April 28, 1997), some of them new to the Game Boy line. There were several limited-edition Game Boy Pockets, including a gold-metal model exclusive to Japan. The Game Boy Pocket was not a new software platform and played the same software as the original Game Boy model. A clear 'skeleton' Famitsu edition appeared in 1997, which had only 5,000 units released, and a clear yellow edition. The Game Boy Light was released on April 14, 1998, only available in Japan. Like the Game Boy Pocket, the system was also priced at ¥6,800. The Game Boy Light is only slightly bigger than the Game Boy Pocket and features an electroluminescent backlight for low-light conditions. It uses 2 AA batteries, which gave it approximately 20 hours with the light off and 12 with it on. It was available in two standard colors, gold and silver. It also received numerous special editions, including an Astro Boy edition with a clear case and a picture of Astro Boy on it, an Osamu Tezuka World edition with a clear red case and a picture of his characters, and a solid yellow Pokémon Center Tokyo version. The original Game Boy lacked a backlight, so many third-party add-ons were created to improve play in low light conditions. Though it was less technically advanced than the Lynx and other competitors, the Game Boy's excellent battery life and rugged hardware and the popularity of the bundled Tetris and other games made it much more successful. In its first two weeks in Japan, from its release on April 21, 1989, the entire stock consisting of 300,000 units was sold; a few months later, the Game Boy's release in the United States on July 31, 1989, saw 40,000 units sold on its first day. The Game Boy and Game Boy Color combined have sold 118.69 million units worldwide, with 32.47 million units in Japan, 44.06 million in the Americas, and 42.16 million in other regions. By Japanese fiscal year 1997, before Game Boy Color's release in late-1998, the Game Boy alone had sold 64.42 million units worldwide. At a March 14, 1994 press conference in San Francisco, Nintendo vice president of marketing Peter Main answered queries about when Nintendo was coming out with a color handheld system by stating that sales of the Game Boy were strong enough that it had decided to hold off on developing a successor handheld for the near future. In 1995, Nintendo of America announced that 46% of Game Boy players were female, which was higher than the percentage of female players for both the Nintendo Entertainment System (29%) and Super Nintendo Entertainment System (14%). In 2009, the Game Boy was inducted into the National Toy Hall of Fame, 20 years after its introduction. As of June 6, 2011, Game Boy and Game Boy Color games are available on the Virtual Console service on the Nintendo 3DS's Nintendo eShop. ^ Japanese: ゲームボーイ, Hepburn: Gēmubōi? ^ Not GameBoy (one word). ^ White, Dave (July 1989). "Gameboy Club". Electronic Gaming Monthly (3): 68. ^ "retrodiary: 1 April – 28 April". Retro Gamer. Bournemouth: Imagine Publishing (88): 17. April 2011. ISSN 1742-3155. OCLC 489477015. ^ "Happy 20th b-day, Game Boy: here are 6 reasons why you're #1". Ars Technica. September 7, 2015. Archived from the original on August 15, 2017. Retrieved June 14, 2017. ^ a b c d e "Consolidated Sales Transition by Region" (PDF). Nintendo. April 26, 2016. Archived from the original (PDF) on May 1, 2016. Retrieved 2016-10-23. ^ "Technical data". Nintendo of Europe GmbH. ^ a b Umezu; Sugino. "Nintendo 3DS (Volume 3 – Nintendo 3DS Hardware Concept)". Iwata Asks (Interview: Transcript). Interviewed by Satoru Iwata. Nintendo. Archived from the original on July 25, 2015. Retrieved March 20, 2013. ^ Beuscher, Dave. "Game Boy - Overview". Allgame. Archived from the original on December 12, 2014. Retrieved September 11, 2008. A team headed by Gumpei Yokoi [sic] designed the Game Boy. Yokoi had previously designed hand held games for Nintendo with the cartridge based Game & Watch system, introduced in 1980. His staff, called Research and Development (R and D) team #1, had designed the successful NES games Metroid and Kid Icarus. What Yokoi's team did was create a hybrid of the NES and the Game & Watch systems. ^ "Satoru Okada talks Game & Watch, Game Boy and Nintendo DS development". Issue 163. Retro Gamer Magazine. 2016. Archived from the original on January 1, 2017. Retrieved January 1, 2017. ^ "AtariAge - Lynx History". AtariAge. Archived from the original on December 1, 2016. Retrieved November 22, 2016. Eventually the Lynx was squeezed out of the picture and the handheld market was dominated by the Nintendo GameBoy with the Sega Game Gear a distant second. ^ Kent 2001, p. 416. "According to an article in Time magazine, the one million Game Boys sent to the United States in 1989 met only half the demand for the product. That allotment sold out in a matter of weeks and its black and white (except for Konami/Factor 5 games and SeaQuest DSV), was shown in color like the Game Gear version." ^ Stuart, Keith. "Nintendo Game Boy – 25 facts for its 25th anniversary". The Guardian. Archived from the original on November 23, 2016. Retrieved November 22, 2016. ^ Audureau, William (March 18, 2015). "NX, Ultra 64, Revolution… Petite histoire de Nintendo à travers ses noms de code". Le Monde.fr (in French). ISSN 1950-6244. Archived from the original on August 17, 2016. Retrieved June 19, 2016. ^ a b "Yakuman for Game Boy (1989) - MobyGames". Archived from the original on June 30, 2016. Retrieved December 30, 2016. ^ Owner's Manual, p. 5. "(12) Operation buttons — The controls for playing games. (See game manuals for button functions.)" ^ Owner's Manual, pp. 4–5. "(5) Volume dial (VOL) — Adjusts the sound volume…(7)Contrast adjustment (CONTRAST) — Adjusts the contrast of the display." ^ Owner's Manual, pp. 3–4. "(3) Game Pak slot — Insert the Nintendo GAME BOY Game Pak here. (See page 7 for instructions on inserting Game Pak)"
^ Owner's Manual, p. 10. "To avoid dust and dirt getting in the Game Boy unit, always leave a Game Pak inserted when not in use." ^ Owner's Manual, p. 4. "(2) External power supply jack — You can connect a Rechargeable Battery Pack (sold separately) for longer play." ^ "Nintendo Game Boy (DMG-001)". Vidgame.net. 2006. Archived from the original on February 11, 2008. Retrieved August 22, 2006. ^ Owner's Manual, p. 5. "(10) Headphone jack (PHONES) — Connect the stereo headphones that come with the GAME BOY to enjoy the impressive sounds of games without disturbing others around you...."
^ Owner's Manual, pp. 4, 8. "(4) Extension connector (EXT CONNECTOR) — Connects to other GAME BOY…Do not insert different games in the interconnected Game Boys." ^ Masuyama, Meguro (2002). "Pokémon as Japanese Culture?". In Lucien King (ed.). Game On. New York, NY: Universe Publishing. p. 39. ISBN 0-7893-0778-2. Pokémon allowed more than metaphorical communication; it made use of a system that created actual communication — a network game. ^ GameBoy Development Wiki (November 12, 2009). "Gameboy Bootstrap ROM". Archived from the original on August 18, 2010. Retrieved October 24, 2010. ^ "Game Boy - 8bc Chiptune Wiki". November 5, 2008. Archived from the original on February 21, 2008. Retrieved March 26, 2009. ^ a b c Amos, Evan (1989). "GameBoy : User Manual, Page 12". Nintendo of America. Archived from the original on June 29, 2011. Retrieved February 12, 2011. ^ Fruttenboel Gameboy Section (August 22, 2009). "GameBoy : Using the GameBoy skeleton for serious business (Interrupt Descriptions)". Archived from the original on September 21, 2014. Retrieved March 25, 2010. ^ "Technical data". Nintendo of Europe GmbH. Retrieved February 4, 2018. ^ "Color it loud with hot new Game Boys; Game Boy reflects players own style with five exciting new colors". Archived from the original on November 2, 2013. Retrieved November 3, 2009. ^ "The Incredible Shrinking Game Boy Pocket". Electronic Gaming Monthly. No. 84. Ziff Davis. July 1996. p. 16. ^ "Game Boy Relaunched". Next Generation. No. 20. Imagine Media. August 1996. p. 26. ^ "Pocket Cool". Electronic Gaming Monthly. No. 89. Ziff Davis. December 1996. p. 204. ^ "Tidbits...". Electronic Gaming Monthly. No. 94. Ziff Davis. May 1997. p. 19. ^ "Show Notes". GamePro. No. 95. IDG. August 1996. p. 16. ^ ゲームボーイライト (in Japanese). Nintendo. Archived from the original on May 30, 1998. Retrieved November 3, 2009. 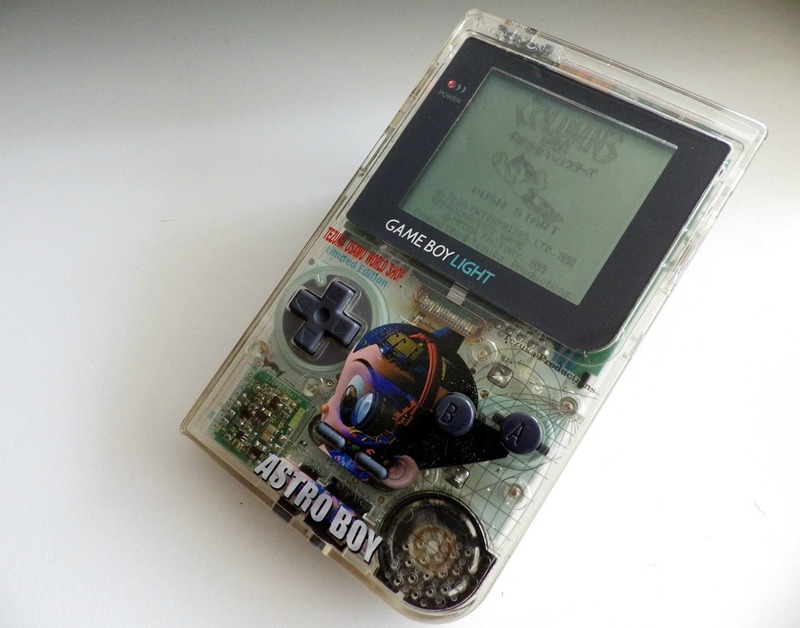 ^ "Clear case Astro Boy edition of Game Boy Light". ^ McFerran, Damien (December 27, 2012). "Hardware Classics: Tezuka Osamu World Shop Game Boy Light". Nintendo Life. Gamer Network. Archived from the original on August 1, 2015. Retrieved June 13, 2016. ^ Maher, Jimmy (December 22, 2016). "A Time of Endings, Part 2: Epyx". The Digital Antiquarian. Archived from the original on December 23, 2016. Retrieved December 23, 2016. ^ Fahs, Travis. "IGN Presents the History of Game Boy". IGN. IGN Entertainment, Inc. p. 2. Archived from the original on April 11, 2015. Retrieved October 2, 2013. ^ "A Brief History of Game Console Warfare: Game Boy". BusinessWeek. McGraw-Hill. Archived from the original on May 9, 2007. Retrieved July 30, 2008. Game Boy and Game Boy Color's combined lifetime sales reached 118.7 million worldwide, according to Nintendo's latest annual report. ^ "Cart Queries". GamePro (61). IDG. August 1994. p. 14. ^ "Makers Of Games Focus On Girls". The Gainesville Sun. January 15, 1995. p. 15. Archived from the original on March 25, 2017. Retrieved March 18, 2012. ^ "''Ball, Game Boy, Big Wheel enter toy hall of fame'', retrieved 5 Nov 2009". Rbj.net. Archived from the original on July 17, 2011. Retrieved August 3, 2010. ^ Reilly, Jim. "GDC: TurboGrafx 16, Game Gear Hit 3DS". IGN/com. Archived from the original on August 23, 2011. Retrieved July 18, 2011. "Game Boy Compact Video Game System Owner's Manual". Nintendo. 1989. DMG-GB-UKV. Kent, Steven L. (2001). The Ultimate History of Video Games (1st ed.). Roseville, CA: Prima Publishing. ISBN 0-7615-3643-4. This page was last edited on 25 April 2019, at 22:36 (UTC).